Budding Ginger and Turmeric : When looking at this week’s CSA farm share, inspiration for green tomatoes three ways popped up immediately: as a pickle, infused with sprigs from your edible flowers; as a curry, combining with wilted sorrel and a mint yogurt garnish; and lastly as a stew with a southern flare, cooking with the spring oregano and epazote. Serve either the curry or stewed tomatoes over rice. Very special this week, we have for a limited time some ginger and turmeric that is perfect for grating into the pan for that curry, brewing into a spring tonic tea, or trying your hand at growing a piece. We have the best results when we use sterile pots and coco coir as the medium. Since these are tropical, they are not frost tolerant and require an average temperature around 75f so having these in pots means they can be moved to shade if we have a heat index of 111f as we did last summer, or moved inside to avoid freezing. Pots on a patio are also much less likely to suffer from soil borne diseases and pests. Turmeric has a downward growth energy so it is planted in fully filled pot near the top to allow fingers to form below. Ginger on the otherhand has an upward growth energy and we plant these very shallow in the pot in the middle of a several inches of soil. Later in the season as the rhizome pushes upward, more growing medium is added. If the ginger is not “hilled up”, it is more likely to push leafy stalks and a better yield is missed out upon. These rhizomes can be harvested in late fall, holding back some sections for future plantings. 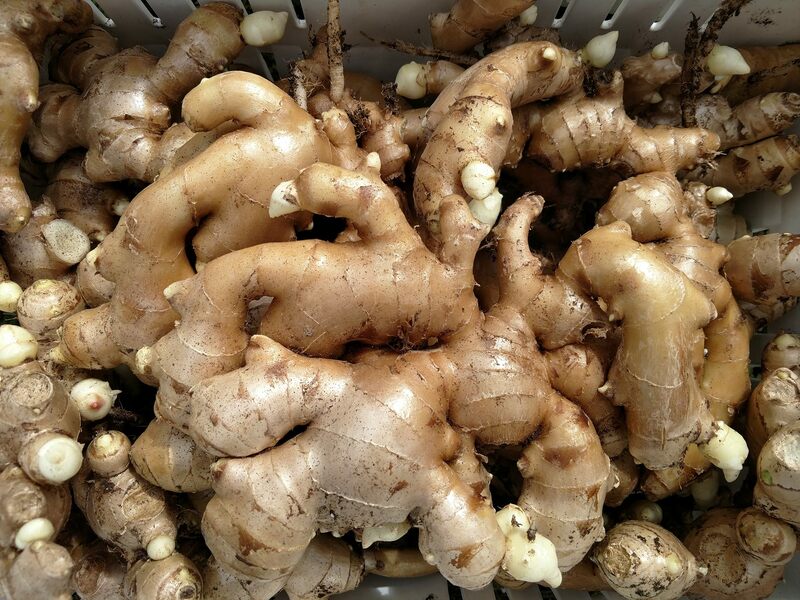 We are working on a new site, www.gingeru.com to facilitate education about growing these. Regardless, they’re delicious! This entry was posted in CSA, CSADist, ginger, turmeric on April 8, 2017 by webmaster.